1. Fishery: The 3T Flake Ice Machine can be directly installed on the fishing boat and use sea water to make ice. The salvaged seafood can be quickly frozen and preserved, and fisheries are one of the most important applications for flake ice machines worldwide. 2. 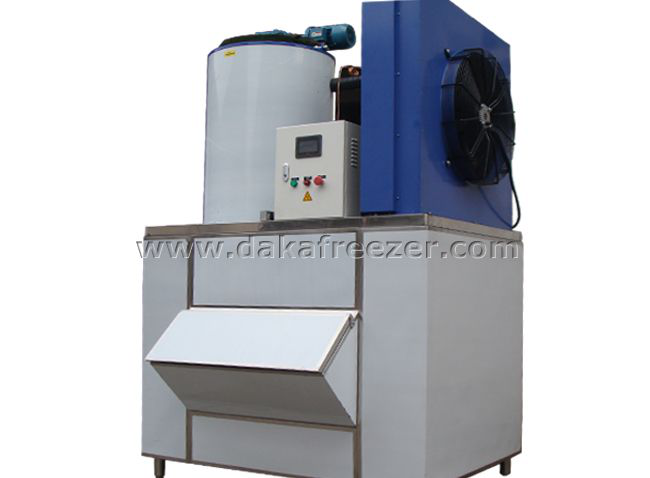 Processing of aquatic products: Fresh Water Flake Ice Machine can reduce the temperature of processing medium, washing water and aquatic products, prevent bacteria from growing, and keep fresh in the processing of aquatic products. 3, food processing: such as bread in the production of stirring or secondary cream, with a piece of ice to quickly cool down to prevent fermentation. 4, poultry processing: in the processing of poultry, meat will produce a huge amount of heat, flake ice can be used for the cooling process of poultry meat, while regulating humidity and quality for the product. 5. Vegetable distribution and insurance: Nowadays, in order to ensure the safety of vegetables, fruits and meat foods, more and more physical methods are used to control temperature in the storage and transportation of products. The flake ice has a rapid cooling effect, creating a low-temperature, high-humidity environment that ensures the subject is protected from bacteria. 6. Pharmaceutical industry: In many experiments of biosynthesis and chemical synthesis, a large number of soldiers need to be added to control the reaction rate and maintain the activity of the organism. The piece of ice is hygienic and clean, and the cooling speed is fast. It is the most ideal cooling carrier in the industry. How To Maintain The Flake Ice Machine 3T In The Tea Shop? How To Install 3T Flake Ice Machine Water Pipe?